A steaming bowl of soup is a hearty, healthful meal. You can use food from your pantry, freezer or leftovers from your refrigerator to make a tasty soup in about 30 minutes following these easy steps. Each pot of soup serves about four adults. The nutritional value varies depending on the ingredients you choose. 2. Rinse and chop one medium onion. • Add to pot and cook over medium heat until tender. 3. Choose one broth. Add to pot. 4. Choose one protein. Add to pot. • 1 pound cooked (or leftover) chopped/diced beef, chicken, ham, lean sausage, etc. 5. Choose one starch. Add to pot. 6. Choose a mixture of 2 to 3 c. chopped vegetables (fresh, frozen or canned). Add to pot. 7. Choose one or more seasonings, add to pot and simmer 20 to 25 minutes or until vegetables are tender. 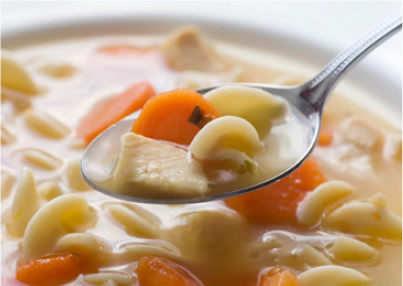 Chicken and rice soup: Combine onion, celery, carrots, chicken, rice, chicken broth, rosemary, parsley and garlic. Beef and vegetable soup: Combine leftover roast beef or browned ground beef, onion, potatoes, carrots, celery, crushed tomatoes, beef broth, oregano, basil, parsley and bay leaf. Black bean and corn soup: Combine onion, green pepper, corn, green chilies, canned black beans (drained and rinsed), rice, crushed tomatoes, chicken broth, oregano, cumin, chili powder, cilantro and garlic. Cream of broccoli or potato soup: Combine onion, broccoli or potato, celery, cheese, milk, chicken bouillon and garlic. Mash or blend together. Source: Adapted with permission from Utah State University.